Dimidis & Sons represents a dream come true for owner Craig Dimidis. "It's a lifelong dream to have my own shop," he says. "After years of working in larger shops where I had no contact with the customer, now I get to really talk to them." Craig's experience goes back over twenty years in the dealership network. He's worked at General Motors dealerships, with extensive background in Toyota and Lexus. Vintage cars are also a specialty. Even while working for "the big guys," Craig always had a stream of cars from friends and family to work on in his backyard. When that off-hours client list grew to be enough for a full-time shop, he took the leap of faith to start his own business. Word of mouth spread quickly about this high-quality shop where you actually got to talk directly with the mechanic. He's never had to advertise ï¿½ and the business keeps growing. "I'm no bean counter," he says. "I'm not only concerned about the bottom line. What I want is to let people know where they stand, and to tell the truth. In your own shop, you can run your own customer service. My goal is to give customers the best driving experience possible. A well maintained car is a happy car, and a happy car makes for a happy driver." 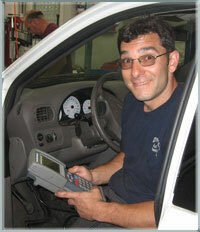 Craig attained ASE Master Automobile Technician in 1992 and Advanced Level Specialist/L1 in 1995. Craig lives in Framingham with his wife, their daughter and two sons. The name "Dimidis & Sons" is looking to the future, since the two sons in question are still in school. But they often visit the shop to "help" Daddy work.